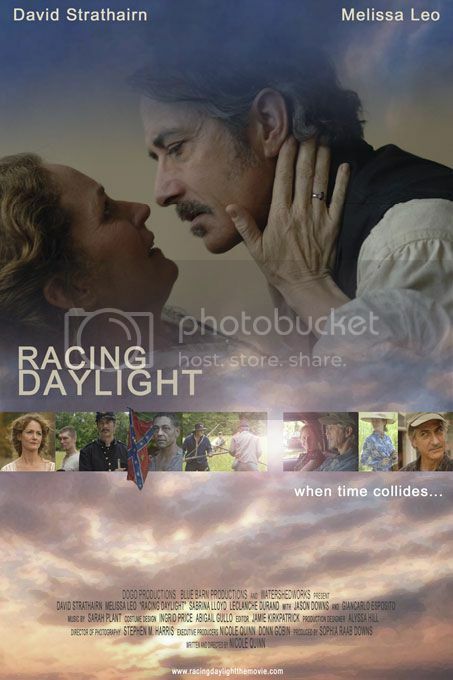 If NPR ever decided to start making movies, Racing Daylight would probably be their first box office smash. (Or flop, actually.) Because Racing Daylight - a tweedy, low-fi look at a small, East Coast town's past and present - is very, very NPR. And it stars David Strathairn! You can't get more charmingly "this American life" than that. Cape Cod ho! Sadie (Melissa Leo) lives a dead-end life on Sesame Street whatever street she lives on in Cedarsville, New York. Death and life are a bit blurred here in Cedarsville, since Sadie's been receiving spectral visitations from Civil War vets. When not seeing ghosts, she tends to her catatonic grandmother (Le Clanche du Rand) and pines mutely after the dashing handyman (and adorably nerdy Civil War freak), Henry (David Strathairn, looking pretty dashing indeed!). The ghosts meanwhile creep in and take over Sadie's life, flinging her back to the high romance of Cedarsville during the Civil War, when she - now named Anna - was pining much more vocally for the dashing soldier, Harry (David Strathairn, now with facial hair and even more dashing! ), and her young, slightly dodgy "killer inside me" husband, Edmund (Jason Downs). Filmed on a shoestring budget, with costumes and props seemingly from the Dollar Store, Racing Daylight has some moments which are adorable and quirky and charming, and many other moments which are scrape-out-your-eyeballs awful. Relatedly, the tone swings wildly around - is it a Gothic horror-romance? Is it a whimsical What's Eating Gilbert Grape?-ish look at the weird and wonderful of American's forgotten poor? Is it a David Strathairn/Civil War broad comedy gush fest? Any of these options would have been great. Unfortunately, Racing Daylight has shrieking violins in one moment and dueling banjos the next. It has some very good acting - such as David Strathairn's pitch perfect weirdness as Henry the Nerd, with his "Do you like facts?" non sequiturs - and some very bad acting - such as Melissa Leo going a bit too broad on the coy girlishness of Sadie-infatuated. The writing is rough. And, overall, everyone is very, very earnest - which earns some points, at least. Hey, we wouldn't mind sitting in a classroom or a museum and watching this while someone explained the threading work in Union uniforms. Hey, so we're earnest Civil War buffs too - sue us! But should YOU watch it? ("Wait, wait, don't tell me!" we hear you cry.) Well... if, like us, you get your kicks from American history and, especially, facts, then yes. There just aren't enough Civil War movies out there, and it's always nice to see a smart Union uniform. Be warned, though, this is not by any measure a "good" movie. It's clunky, clumsy, awkwardly filmed and very cheap. If you want fancy, polished filmwork on the era, go for Glory (to cry), Gettysburg (to learn, and then cry), Cold Mountain (OK, we haven't actually seen this one) or Shenandoah (to Jimmy Stewart). If you don't need to focus on the Civil War, but instead would just appreciate a handheld tour through history with David Strathairn, preferably in a state of romantic poverty, then you can watch any number of excellent John Sayles films - Limbo (Alaska! ), Matewan (West Virginia! ), Eight Men Out (daaaa Bears!). If you don't have any of those at hand, this will do. Oh yeah, and if you like Tom Waits' experimental industrial music with saws and banjos and other hard-to-identify instruments, you can watch this. The intro music is crazy! <=== and what is that cover about? !